You can disable the touch screen driver on Windows if you have a touch screen monitor but don't want to use Zoom Rooms for Touch. This will allow you to use a touch screen monitor as a regular Zoom Rooms display. Log in to your Windows PC as an admin. Exit the Zoom Rooms for Touch application if it is running. Hold down the Windows key and press S, then enter "device manager". Double-click Human Interface Devices to expand it. 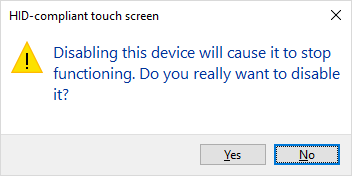 Right-click HID-compliant touch screen, then click Disable device. You will see an icon beside HID-compliant touch screen to indicate it's been disabled. The monitor will be used as a regular Zoom Rooms display.